Watershed moments in this business are rare. It is not often that you see any one game or decision fundamentally change the landscape of the industry, but it does happen. The first Metal Gear Solid comes to mind, as do Halo: Combat Evolved and Call of Duty 4. Years, even decades, after release, their influence on gaming can still easily be felt. This April, God of War joined these and other games on that short list by redefining what is possible in game direction and design. Not content to merely continue an already beloved franchise, director Cory Barlog and the team at Santa Monica Studio chose a radical departure from the series’ established formula and, in the process, raised the bar for interactive storytelling with cinematography and perspective as vital to the narrative as scripting and voice work. While technically a direct sequel to 2010’s God of War III, this latest entry also serves as a soft reboot of the entire franchise in several important ways. A new setting, a new style of gameplay and a drastically different tone make for a God of War that is more mature, nuanced and rewarding than ever before. God of War begins on the eve of an important journey. Kratos now lives in exile, far from Sparta in the realms of the Norse gods, with his son, Atreus. The boy’s mother has just passed away, and her final wish – for her ashes to be scattered from the highest peak in the realm – forms the backbone of your quest. Not only does her death provide the reason for your trek through all of Norse mythology, it soon becomes clear that the mutual desire to honor her memory is the only bond Kratos has with his own child. Atreus is desperate for his father’s approval, and Kratos is incapable of connecting emotionally with his son. Before Kratos and Atreus can leave on their journey, they are visited by someone identified only as The Stranger. Who he is, and what he wants, is a mystery at the center of God of War’s story, though anyone familiar with Norse mythology will have less to keep them guessing on some fronts. It’s difficult to discuss the plot of God of War without spoiling things, as the narrative is purposefully obtuse in the beginning, choosing instead to focus more on the father-son dynamic, or more accurately the lack thereof. It speaks volumes about the confidence that Santa Monica Studio had in the overall tale they were telling that they were willing to devote so much of the game’s first hours to little moments that arise from fractured family relationships, as Kratos and Atreus try to grieve and reconnect at the same time. This is especially surprising given the nature of the series to date, and its tendency to start with huge, action-oriented set pieces. Where previous God of War games were epic in scale and focus, this year’s entry is equally dedicated to more personal affairs. 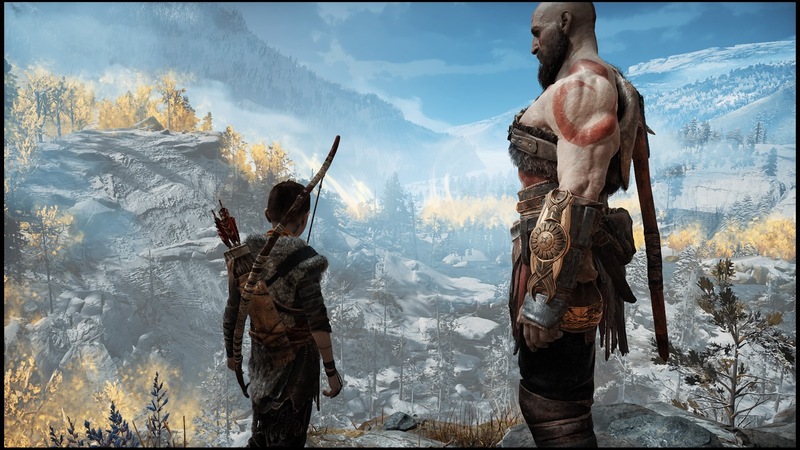 While the plot eventually picks up and the story gradually builds into to the sort of grand tale we’re used to, God of War never stops being primarily about fathers and sons and the complicated relationships that so often define them. While most story-driven games these days are edited largely the same way as Hollywood blockbusters, God of War bucks this trend completely. From the moment the game starts until long after the credits roll, the camera never cuts away from Kratos and/or Atreus. There are no cutscenes in God of War, no flashbacks or montages. The story takes place entirely in real time, and Santa Monica Studio never lets you lose sight of the immediate, moment-to-moment interactions between its two lead characters. This particular design decision isn’t just an incredible technological feat that creates a unique visual aesthetic, it forces on audiences a much more intimate method of storytelling. Instead of the epics we’ve come to know and love, we get a very personal story that is told as much by how certain shots are framed as anything else, such as times when a moment of tension between Kratos and Atreus is finally broken and the boy runs on ahead only for the camera to stick with Kratos as the sorrow or anger he was trying to hide can finally play across his face. And make no mistake, this is a very different Kratos than the one you may be familiar with. No longer fueled by a seemingly bottomless pit of rage, our titular character is now far quieter, more reflective and tempered. There are even moments when he tries to avoid conflict entirely, despite knowing one or two swings of his axe could solve things much more quickly. We’re not sure at first if this is merely for the sake of the boy, the past taking its toll on him, or some combination of the two, but at times it’s hard not to think the fire that burned inside Kratos for so many years is finally starting to dwindle. For someone who has seemed capable of literally anything over the years, the prospect of raising Atreus on his own seems too large a burden to bear. The initial contrast between father and son is striking, as Atreus begins the game a sickly little boy who cannot fend for himself, no matter how desperately he wants to emulate his father as so many young men do. The tension between them is incredibly effective and believable, which is important to the overall themes presented throughout. Thanks to some truly fantastic voice work by Christopher Judge and Sunny Suljic (Kratos and Atreus, respectively) we get a family dynamic that is not only captivating and at times heartbreaking, but relatable despite its being anchored in ancient Norse mythology. Regardless of the change in narrative direction, however, this is still a God of War game at its core, and that means violent combat with brutal weapons and deadly finishers. The instruments of destruction are different, and the combat itself is a bit weightier and more tactical, but it delivers the same visceral thrills you’ve come to expect. You begin your journey with the Leviathan Axe, a shield, and a basic move set. This is no ordinary axe, however, and even with nothing but the core skills at your disposal, you’re still a deadly adversary. The axe can be thrown and instantly recalled, much like Thor’s hammer. It can also freeze enemies and objects, giving it even more range and versatility than Kratos’s old Blades of Chaos. Light attacks are mapped to the R1 button, with slower, heavier attacks set to R2 (though you can select the “Classic” control scheme in the Options menu if you’re looking for something that plays a little closer to the original games). Each of these base attacks can be modified by using L1 to activate Runic attacks, once you have acquired some runes to socket into your weapon. These function much like the various combos at your disposal in past games, but additionally come with cooldowns preventing you from spamming them repeatedly. Additionally, you can only equip two attack runes at once, though you’ll find a dozen or more along your way. Needless to say, the days of simply holding L1 + Square until everything is dead are over. For the first time in the series, Kratos can also use his fists in unarmed combat, in tandem with his shield. Faster and almost as powerful as his axe, opting for unarmed combat is often preferable. Melee attacks build up an enemy’s stun meter which, when full, allows them to take more damage and leaves them open for finishing moves which can be triggered by hitting R3. It’s the sort of feature that, once added, makes you wonder why it wasn’t always there. Your Spartan Rage (also known throughout the series as Rage of the Gods and Rage of the Titans) also utilizes melee attacks exclusively now, instead of simply giving you a massive, temporary boost to offense and defense. Melee attacks during Rage still build stun meters, only much faster, and in this mode your melee finishers can regenerate your meter and extend the length of time you can use Spartan Rage. Even better, you can upgrade your Rage combat specifically, creating new combos and moves to increase your damage and better deal with mobs or larger, single enemies. Another first in the series is the ability for Kratos to fight alongside someone else. While Atreus is not very effective in combat at the beginning of your journey, through patient (if incredibly blunt) tutelage from his father, he soon becomes vital to your overall strategy. Some of the more difficult enemies cannot be defeated without the help of Atreus’s bow attacks, which can stun, shock or even kill foes. Targeting faster enemies with bow attacks to slow them down, or building up the stun meter to more quickly enable finishing moves are often the difference between life and death. Over time, Atreus can learn more direct offensive abilities that aid Kratos in additional ways. All of your gear, including your weapons and clothes, have various stats that define their efficacy in combat, much like more traditional action RPGs. On your journey you will meet two Dwarven brothers, Brok and Sindri, who can upgrade gear or even craft new armor using materials you have acquired along the way. Upgrades to your weapons are the rarest of all, obtained only through major story events. Unlocking these powerful upgrades opens up new skills for both characters to learn. Your gear can also be socketed with various enchantments that slightly alter one or more of your base stats. This, combined with the plethora of different armor, runes, and other stat adjustments, creates a system that might be a little too deep for its own good, as I spent considerable time fiddling with the infinite combinations, fretting over minor changes to this stat or that, when all I really wanted to do was get back on the road. Within the first few hours, Kratos and Atreus come upon the Lake of the Nine in the center of Midgard, which serves as the central hub of the Nine Realms of Norse mythology. From here you can eventually travel to all the various realms available in the game, some of which exist solely for exploration. Unlike the linear paths you may be used to, God of War not only allows for open world adventuring but actively encourages it. At certain points in the story, Atreus will suggest that now would be a fine time to explore your surroundings, hinting that it’s a good place to stop and look around, though you can venture off the beaten path any time you want. There are a surprising number of side quests to undertake in the game, known as ‘favors’, which offer a variety of rewards. The most important of them, commissioned by the Dwarven smiths, enable you to drastically upgrade your gear so that you can undertake the more dangerous adventures towards the end of the game. Because of this, God of War does not present a consistent difficulty curve like previous entries, as too many side quests can leave you over-powered for the difficulty level you initially selected. Thankfully you can choose to raise or lower the difficulty at any point in the game without penalty (other than restarting the current checkpoint), meaning you can always select a difficulty that is appropriate for your current skill level or desired challenge. Whenever you run into particularly nasty fights, it is also possible to use Resurrection Stones, which allow Atreus to quickly run over and bring you back to life to continue the fight. Only one stone can be carried at a time, and they can only be purchased from Brok or Sindri, which keeps them from being abused to bypass any and all obstacles you may encounter, but they do come in handy with some of the more difficult encounters. As you travel through the realms, you won’t just encounter tough enemies, but challenging puzzles as well. Difficult puzzles have been a cornerstone of God of War since the beginning, often spanning entire levels that essentially functioned as one large meta puzzle, such as Pandora’s Temple or Hera’s Garden. Like most things, puzzles in this God of War work on a smaller scale, but they’re also more intuitive and rewarding than ever before. Eschewing the old block puzzles and labyrinths, Kratos and Atreus must decipher linguistic riddles and manipulate their environment to progress. This is another way in which Atreus seeks to prove his usefulness to his father, as he can use arrows to create bridges of solid light, or detonate explosive objects so that the two can access new areas. His talent for languages, in contrast to his father’s inability to read anything but Greek, also makes for some gentle humor to occasionally lighten the mood. The realms you travel to vary wildly in both what they offer and how they appear, but all are fraught with danger and incredibly beautiful. God of War has always been a series on the cutting edge of visual design, pushing the boundaries of what we can expect from a console game, and that has never been truer than today. The sense of scale in this open world is sometimes too vast to really take in, because while the worlds often seem like they go on forever, everything within them is crafted with an eye for detail, right down to individual rocks and flowers; there is no wasted space, no empty “big because it can be” level design. It’s a world that feels truly alive, a creation you genuinely want to explore as opposed to a level you walk through to get to your next objective. It is comparable, but also vastly superior, to 2016’s Uncharted 4. The creativity in the world design here is second to none, with breathtaking vistas on a scale more immense than I ever thought possible. There’s so much to God of War that it would be impossible to cover it all in the span of one review, especially in such a way that doesn’t spoil anything. Ultimately it is a game that has to be experienced firsthand to truly appreciate. A bold and ambitious design philosophy by a creative team that was not afraid to take huge risks with an established property, God of War is the rare AAA title that was somehow also a gamble in today’s largely risk-averse big budget climate. I’m still amazed at just how far director Cory Barlog and his group went in reinventing a beloved franchise while staying true to the essence of what made it beloved to begin with. More importantly, this brutally violent mythological adventure was the last place I ever thought I’d find deep, meaningful ruminations on what it is to be a father, and the sacrifices involved. God of War is brilliant in ways I never thought games could be. That it’s also perhaps the most highly polished game I’ve ever played, with unsurpassed presentation and mechanics, is actually secondary to the fact that it generated in me the kind of childlike awe I haven’t experienced in decades. I have been writing about video games for almost 20 years now, and in all that time I have never given any game a perfect score. Until now.